For the lovely Billy Harper, Butternut Lake is the place she feels most at home, even though lately she feels the only one listening to her is Murphy…her faithful Labrador Retriever. Her teenage son, Luke, has gone from precious to precocious practically overnight. Her friends are wrapped up in their own lives, and Luke’s father, Wesley, disappeared before his son was even born. No wonder she prefers to spend time with a good book, especially ones where everything ends in perfection. But Billy is about to learn that anything is possible during the heady days of summer. Coming to terms with her past—the death of her father, the arrival of Cal Cooper, a complicated man with a definite interest in Billy, even the return of Wesley, will force her to have a little bit of faith in herself and others…and realize that happiness doesn’t always mean perfection. 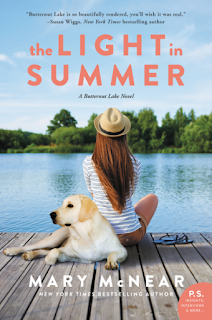 The Light in Summer tells the story of Billy Harper, a small town librarian in Butternut Lake, Minnesota. She is a single mom dealing with a rebellious 13 year old and the recent loss of her father. When Cal Cooper comes to town after his recent divorce, the connection between Billy and Cal is immediate. Will they be able to build a relationship that helps them both heal? This is a lovely summer beach read about good people trying to make their way in the world. There is so much I enjoyed about this book. The small town Butternut Lake setting is delightful. I read the first couple of books in this series and enjoyed them, and then picked the series back up with The Light in Summer. This book would work fine as a standalone for anyone new to the series. I love that Billy is a librarian and she really loves books. She goes out on her porch at night and reads Jane Austen to relax. She loves suggesting books for library patrons, and even recommends my favorite series (Betsy-Tacy by Maud Hart Lovelace) to a young girl. Cal is a strong and likable man, and I really liked his relationship with Billy. It was based on friendship and mutual respect as well as romantic sparks. I loved these characters together and was pulling for their happiness. The story of Billy's son Luke and his attempts to find his place in Butternut Lake as he enters his teen years with friends and with his missing birth father is a touching aspect of the book. And there is even a lovable dog -- Murphy the yellow lab, who is so warm and empathetic that Billy has silent conversations with him out on the porch each night. The Light in Summer is such a heartwarming, uplifting book, perfect for a leisurely summer read. I recommend it highly for fans of women's fiction, small town fiction, and contemporary romance. I received a copy of this book from HarperCollins and TLC Book Tours. I've been wanting to read the Butternut Lake books for quite some time - it seems like one of those places that I need to have in my reading life. I like feel good books like this, with book-loving characters and, as you said, good people just trying to make their way in the world.